Paul Combs’ book Dameronia – the Life and Music of Tadd Dameron, is now available from the University of Michigan Press. The book can also be ordered at Barnes & Noble and Amazon.com. The book can also be ordered, signed, directly from me . Working with college level jazz ensembles to take the students inside Dameron’s work by organizing concerts of the many scores by Tadd Dameron that I have collected. Dameron 2017, a year-long celebration of Dameron’s music to take place during his Centennial year, featuring not only his well-known compositions, but revealing the “unknown Dameron,” his many unrecorded and under-perrformed masterpieces. 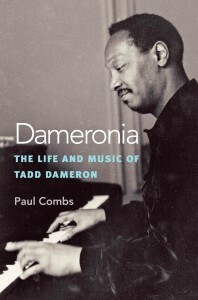 In addition, there will probably be articles developing insights achieved by further exploration of Dameron’s music, and those will be included here.